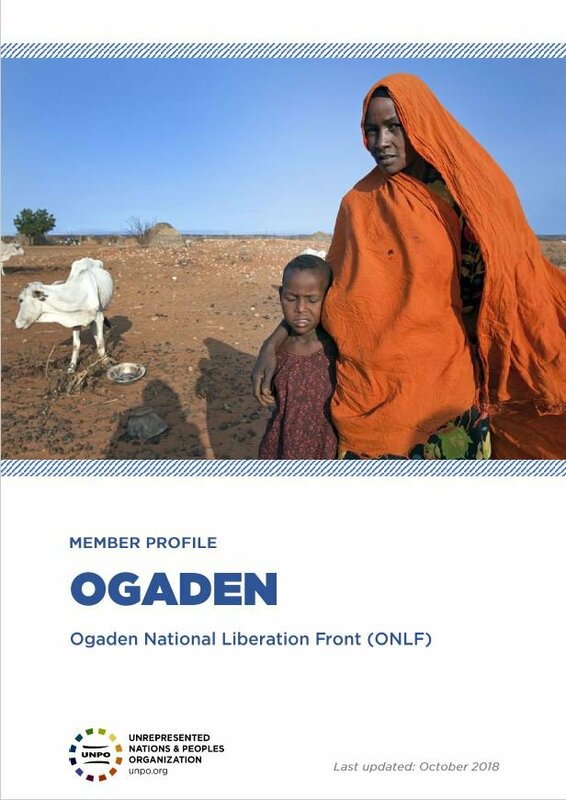 Ogaden is represented at the UNPO by the Ogaden National Liberation Front (ONLF). They were admitted to the UNPO as a member on 6th February 2010. Ogaden, also referred to as Western Somali Region or Ogadenia, is one of the nine ethnically defined states of Ethiopia. The region is officially known as ‘Region Five’ or Somali Regional State (SRS). 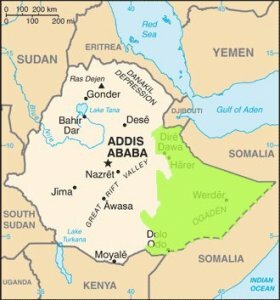 Ogaden is the easternmost region of Ethiopia, bordering Djibouti and Somaliland to the north, Kenya to the south-west and Somalia to the east and south. Jijiga is the capital of the Ogaden region. The Ethiopian government’s previous neglect, as well as the more recent acts of violence committed against the Ogadeni people have contributed to exceptionally precarious living conditions. The people of Ogaden suffer from a lack of official representation in the social, cultural and political fields. Government-imposed embargoes on the region have furthermore prevented Ogadeni communities from accessing trade relations and aid from foreign countries and non-governmental organisations. The economy of the Ogaden region relies heavily on livestock and agriculture, but has been affected by catastrophic droughts and famine. Consequently, access to land as well as freedom of movement are issues of fundamental importance, particularly for the Somali, i.e. the majority population of Ogaden, who are historically rooted in a culture of pastoral nomadism. Land expropriations targeting the Ogadeni people and subsequent controversies have brought about further tensions between the people of Ogaden and the local and national authorities, particularly due to government policies of clearing and selling large tracts of land to foreign investors exploring the vast oil and gas resources of the region, and of redistributing land to farmers of non-Somali ethnicity. In response to the many challenges the Somali people in Ogaden have been facing and the instability affecting the entire region, the ONLF was founded in 1984. Attempts to gain self-determination have so far been violently suppressed by the ruling Tigrayan elite and the Ethiopian People’s Revolutionary Democratic Front (EPRDF). The Ethiopian military has furthermore been frequently accused of committing gross human rights violations (UNPO, 2017). Due to the fact that the ruling elite of Ethiopia is suppressing a large portion of the country’s many ethnic groups and nations, the ONLF founded a political alliance with other opposition movements against the government’s oppression in 2015. The People’s Alliance for Freedom and Democracy (PAFD) consists of the ONLF, fellow UNPO Member Oromo Liberation Front (OLF), the Benishangul People’s Liberation Movement (BPLM), the Gambella People’s Liberation Movement (GPLM) and the Sidama National Liberation Front (SNLF). The alliance is working towards a political solution to the country’s conflict and an end to the suppression of the Ethiopian people. Please download our Ogaden Member Brochure.